Seeing your site at the top of Internet search results is your dream? It can now be a reality! However, search engine optimization (or SEO for short) takes some time and effort, on several fronts, since numerous factors impact your ranking. 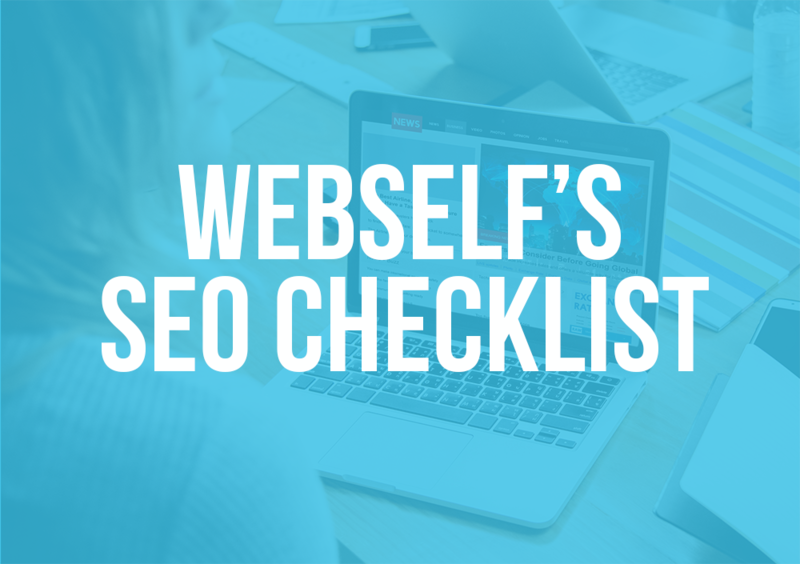 To help you, WebSelf offers a SEO checklist in your site’s dashboard. Step by step, we’re going through the best ways to improve your ranking, as well as the mistakes to avoid. A keyword is a word or group of words, typed in by a potential visitor, so as to search for and find a website. Indeed, you should choose yours wisely and decide which words should point to your site. Put yourself in your visitor’s shoes: which word would they type to try and find you? Establish a Top 10, to focus only on the most relevant words. Take a moment to choose your domain name, as this hugely impact the visibility of your site and brand. It can indeed help with SEO. We encourage you to use dashes (-) if you have several words in your domain name: each one will be more legible. Similarly, try and avoid long names and special characters, to make memorization easier. For SEO purposes, you can tweak it, as it’s advisable to use keywords directly in your URLs. Choose a URL address that contains keywords specific to that page. Avoid run-away name for easier memorization. Use dashes to single out each word (-). The title tag is the first detail analysed by search engines and the most visible. It’s displayed for each entry on the list of search results, and must thus concisely and precisely describe your main topic. The main title tag of your site is your home page’s. Take a few minutes to think up a short title that fits the content as much as possible. As always, a text field, like the title tag, is an opportunity to slip in a keyword or two, so as to improve SEO. It’ll be much more efficient if a page’s title tag is specific to that page and only that page. You can add the title tag in the SEO settings tab, from the Pages menu situated in the left-hand column. The meta-description is also displayed in search results. Add your short description of the page’s content in the SEO settings tab, from the Pages menu in the left-hand column. The description must be short, in between 70 and 160 characters, but still read like a natural-sounding paragraph. Indeed, include as many keywords as you can, but still add them as a real text, and not in list form. For more tips on meta-description, visit our dedicated article. Now that you’ve created pages your WebSelf site, you must clearly display their titles in the site itself, not just in the search results. A good title will contain the keywords you’d like visitors to find you by, as well as guide your visitors’ gaze through your site. These are texts describing the images and photos on your site. If a picture cannot be displayed (due a server issue or a bad connection) or simply cannot be read (like by screen-readers for visually-impaired users or by a search engine), then the alt text will be used instead and the loss of information will be minimized. This makes this field very important for your site’s ranking in search results. For each new image module added to your site, the Alt Text field can be modified: just add a quick description of said image. A favicon is a computer icon used to identify a site in the url bar, the title bar, a list of browser bookmarks, a browser tab, or any other shortcut. A favicon is part and parcel of your site’s branding; using it help users associate certain graphics or colours more closely with your site. That’s why your logo generally makes for a good favicon; otherwise, WebSelf offers you a wide selection. Lots of website owners start on the SEO only once the site is done. However, if you should start considering SEO as soon as you’re starting on the content: indeed, content are a prime target for search engines and are heavily used in deciding your ranking. You already identified your main keywords during step 3: now, simply keep them in mind as you write: the more you can weave them naturally in your texts, the more the search engine robots will recognize them as relevant to your site. Not all SEO endeavours happen on your site. The more visits to your site you can arrange for, the better your ranking. Don’t forget to add a link to your site in your emails’ signature, on your business cards, on pamphlets, and all other branded material. When using organic SEO, a big deciding factor between two competitors is the number of sites pointing to your own. They are crucial in your SEO strategy. First of all, they bring more visitors to your site, and secondly, they boost your ranking. Indeed, search engines consider that the more numerous the other sites that promote your own are, the more interesting and relevant your content is. And search engines’ algorithms just love relevancy! Is It Still Pertinent in 2019 to Have a Blog? When Should I Publish my Website? 5 tips to Increase Your Online Sales for the Holidays! 6 image banks for awesome photos! SEO in 2018: what are the priorities? New features on the WebSelf online store! Why you should get a premium plan for your website! Here are the new WebSelf templates! Take care of your virtual appearance! The new Spring templates are here! The online store templates are now available! The WebSelf online store is now available! Describe your images by using the "ALT" Attribute. Are your pages optimized for success? Tools to make your website go further! Make sure your customers can find your site! A picture is worth a thousand words, take the time to select your vocabulary! The web world is in changing, learn how to write for it! Finished writing your article? Great, now the work starts! Facebook Ads : an unparalleled success! Does your website make the phone ring? Hey, psst! Need a little tip or advice? WebSelf is an online editor that allows you to easily build a website. No programming skills are required. Discover How to create a website in 3 easy steps. Register for free, Choose a design among the themes offered and create your content. Everyone can easily create a free website with WebSelf.net. WebSelfTM is a registered trademark, specialized in creating websites for professionals and small businesses.